If your hair is thick, try wrapping the full length of your TRASH TIE without folding it first. Then twist the two tie ends together to "lock" it in place. I can't say how great this is for curly hair as well. 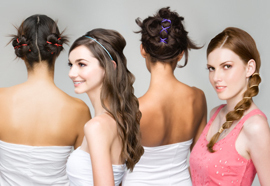 You can put in a ponytail without frizzing out your curls (the way an elastic band does). A TRASH TIES ponytail is elegant and sophisticated. Hook the end of a TRASH TIE around your ponytail. Then wrap the tie down the length of your hair. If your hair is thick, your wraps will be spaced further apart. If your hair is fine, the wraps will be closer together. You'll want the tie to wrap most of the way down your hair. Leave about 4" of the tie unwrapped. This bit of tie will be used to secure the bun in place later on. Stitch the last bit of tie through the hair next to your head, as in the photo above, then fold the tie back on itself to "hook" the bun in place. Tuck the tie end under your hair to conceal. This will hold even the heaviest hair -- no bobby pins needed! Creating new hair-dos with long TRASH TIES can be a bit like sewing. And since a lot of you are visiting from my favorite playground, the craft and sewing world, perhaps this bit of insight alone will inspire some amazing new hair-dos. I often tie my hair up without any initial plan, wrapping, twisting and stitching my hair in place with a TRASH TIE or two until I've got something fun going on. You guys are a creative lot -- you're going to have a ton of fun with these! • TRASH TIES are also available in a set of five 4" ties. To see how they work, visit The Basics page for our Standard Ties and have a look through the TRASH TIES Gallery. 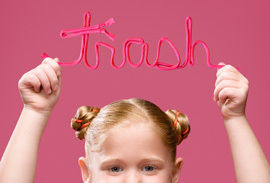 • You can combine both lengths of TRASH TIES to create an expanded variety of hairstyles. Stay tuned at the TRASH TIES Blog and we'll show you some fun ways to go beyond what's included in the 16-Page Style Guide that comes in each box. 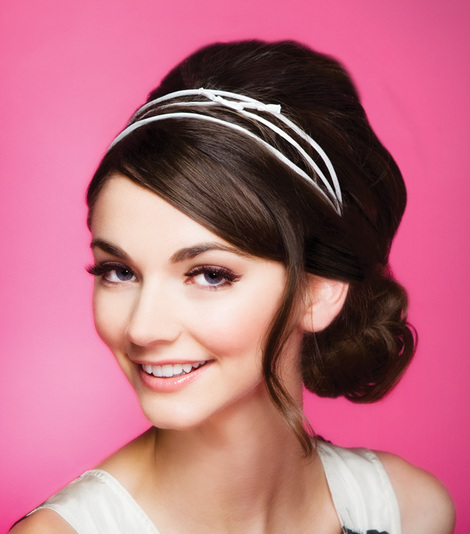 • Use TRASH TIES to fasten fun bits and baubles to your hair-do, like ribbon or flowers. • When it's time to let your hair down, un-fold your TRASH TIES instead of tugging them straight, to prevent kinks. Okay, so now you need some, right? And so does everyone you know? Perfect. Click the link below and stock up!